Money in the Garage: Let the Seasons guide you ! Let the Seasons guide you ! You can sell any stuff at any old time of the year on Ebay. But I find it's best to sell items "in-season". This ensures the best dollar return on a listing. While many things sell well any time of the year, (vintage radios, old Barbies, old signs, ect) you should list seasonal items only at the appropriate time of year. For example, not many Ebay buyers are looking for a Department 56 Christmas Village Piece in July, or a Brett Favre football jersey in March. While they may sell, you are not going to earn nearly the amount you would during the item's primary "Selling " season. Listing an item "in-season" ensures the largest amount of buyers are looking for them and can result into a high closing bid. My selling pattern works something like this, Christmas collectibles are sold after Thanksgiving. Dead of Winter is hockey and basketball jersey time. In the spring, I bust out my baseball jerseys when most fans are psyched for opening day . Camping gear always sells well in Summer...you get the picture. Here is another more obscure example; have you noticed when the weather gets warmer all the "Lance Armstrong" cycling types begin to crowd the local roads? That's the time to sell cycling jerseys! 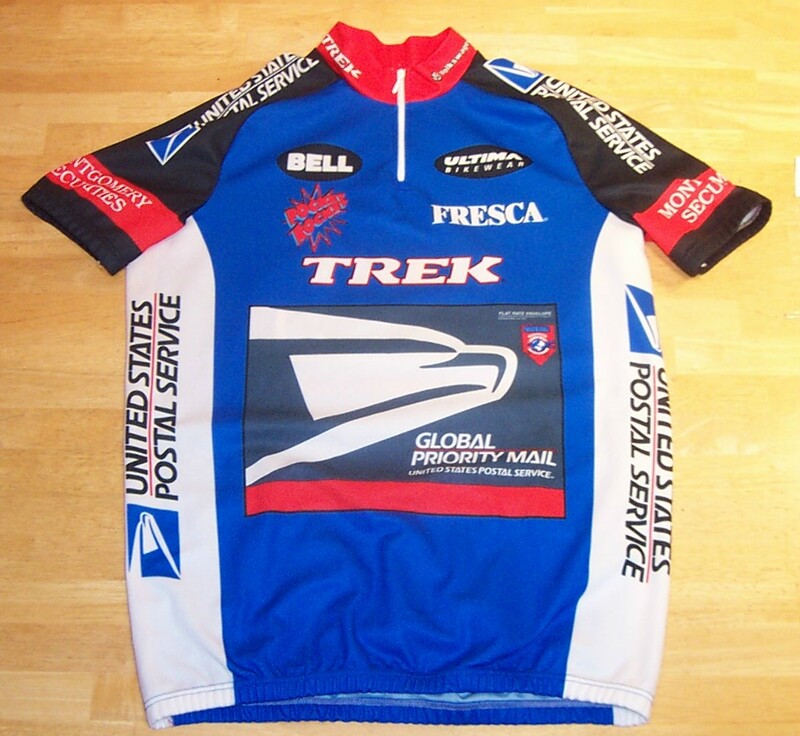 Cycling jerseys are a "can't lose" sale. While you won't get rich off them, they will consistently sell in the $20 to $30 range or more. I often find these jerseys at my local Goodwill Store. The more logos and color graphics on the jersey, the more bidders seem to be interested in them. The US Postal Cycling Team jersey seems to be one of the hottest, primarily because Lance Armstrong wore it when he was on the team. The jersey seen in this picture was purchased for $4.00 and sold on Ebay for $26.00, not bad right? So use the Seasons as your inventory selling guide. It will maximize your profits! Let a million yard sales bloom....! My wife spots things that I walk right by !